Abstract: Due to increased uses of various RNAs in understanding critical structural, functional, and regulatory roles of RNA in biology, rapid, reliable, and cost-efficient methods of RNA oligonucleotide synthesis are in demand. Traditional methods of RNA synthesis based on 2'-silyl (TBDMS or TOM) protection strategies are limited in their ability to construct oligos longer than 40 nucleotides in length (far smaller than important biologically active RNA molecules). A significant improvement in RNA synthesis technology, 5'-silyl-2'-acetoxy ethyl orthoester (2'-ACE) chemistry, results in faster coupling rates, higher yields, greater purity, and superior ease of handling. Using 2'-ACE chemistry, we have developed convenient and efficient protocols to synthesize: (1) long RNA sequences in excess of 100 bases, (2) transfer RNAs (tRNAs) with natural modifications such as pseudouridine, m2A, and m2G, (3) RNA oligonucleotides highly modified with virtually any chemical modification; and (4) long RNA with dual-labeled fluorescent dyes. 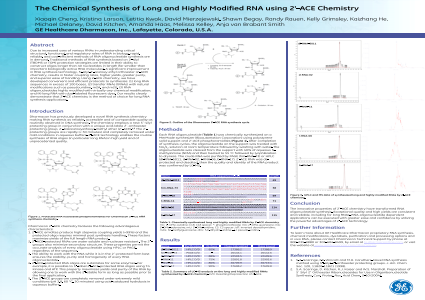 Our results clearly demonstrate that 2'-ACE chemistry is the method of choice for long RNA synthesis applications. Summary: Dharmacon has previously developed a novel RNA synthesis chemistry making RNA synthesis as reliable, accessible and of comparable quality as routinely observed in DNA synthesis. References: S.A. Scaringe, F.E. Wincott and M.H. Caruthers. Novel RNA synthesis method using 5´-silyl-2´-orthoester protecting groups. J. Am. Chem. Soc. 120, 11820-11821 (1998). Synthesis. Curr. Protoc. Nuc. Acid Chem. 2-10 (2004).